They offer an inclusive approach to addressing the affordable housing crisis in Oakland. Joshua Simon is executive director of the East Bay Asian Local Development Corporation. Oakland has an opportunity to be a leader in creating mixed-income neighborhoods that address the housing crisis. Research shows that mixed-income neighborhoods with space and activities designed to bring neighbors together provide the most equitable opportunities for people with low incomes and educational levels. The nonprofit East Bay Asian Local Development Corporation (EBALDC) has partnered with local developer,= UrbanCore Development to propose a new mixed-income, multi-family community on the publicly owned East 12th Street site near Lake Merritt in Oakland. Our proposal includes the maximum feasible number of affordable housing units (30 percent of our complex) and market-rate units; requires the least amount of subsidies from outside sources; and provides two-, three- and four-bedroom homes, along with a range of additional community benefits. We explored a number of different affordable housing possibilities — including locating both market-rate and affordable units in the same building. After analyzing the scenarios, we determined that if we created a separate condominium building for the affordable apartments, we could build more affordable homes at deeper affordability; design for larger households (two- and three-bedroom homes); and create a market-rate building that targets a range of incomes — one that would include units that have rents that are accessible to working families. EBALDC would also have full control over the affordable housing building without the influence of market-rate investors in order to provide a range of resident services — such as healthcare services; computer training; childcare; after-school youth programs; individual counseling and referral services; resident organizing; and leadership development to engage residents in their own communities. 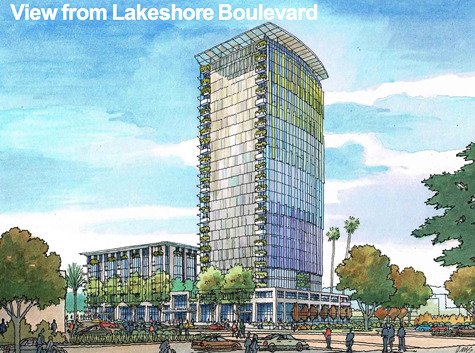 Our proposal calls for a market-rate tower that includes affordable units next to a standard seven-story affordable complex designed for families. To maintain affordability, most affordable housing complexes are no more than seven stories tall, because buildings taller than that require a steel frame, which is significantly more expensive to build. Our two buildings will be on a common platform with a single entrance and shared facilities. Our plan will create a truly mixed-income community and provide housing options for the full range of Oakland's workforce. When the state eliminated redevelopment agencies, Oakland lost a major funding source for community improvement. This left the city with few resources to address the tremendous pressure on the city's housing market. With a number of companies now moving to Oakland, the number of people looking for housing will continue to increase. Yet, even if the entire city budget for a year was spent on building affordable housing, we could not build enough to solve the current problems. However, by building 252 market-rate apartments and 108 affordable apartments on the same site, we will have fewer families bidding up the cost of existing housing across the city. Driven by economic reality and needs of the city, we believe that our project is a model for addressing the affordable housing crisis by developing mixed-income communities. As housing prices continue to increase, the people who have the stability of affordable housing are the most reliable potential workforce for the increasing number of employers in Oakland. Our housing is designed to be family-friendly for Oakland's workforce and accessible to households with wage-earning family members employed as teachers, caregivers, security guards, home-health aides, administrative workers, construction workers, artists, clergy, nonprofit workers, as well as technology and finance workers. We see the East 12th Street site as an opportunity to demonstrate the viability of healthy mixed-income developments in Oakland. EBALDC remains committed to providing longtime residents with options to stay and not be priced out of the area. We will continue our advocacy work with the community to support enforcement of tenants' rights, including rent-controlled land, inclusionary zoning, impact fees, and other policy tools. In addition to new developments, we are seeking opportunities to buy existing apartment buildings and stabilize the rents to make them more affordable. And finally, we are also committed to addressing economic opportunities through our healthy neighborhoods collaborations, where we bring assets and resources to neighborhoods, such as fresh-food access, educational opportunities, healthcare, small business development, and job opportunities. Many years of not building enough market-rate and affordable housing throughout the entire Bay Area has caught up with us in the form of higher rents. Significant amounts of new market-rate and affordable housing will be required to accommodate the thousands of families who are moving to this region. Our organization has been building innovative affordable and mixed-income housing and community facilities for more than forty years. We strongly believe that mixed-income neighborhoods that are designed to connect neighbors are healthier, more equitable places that provide more opportunities for residents in Oakland. Save Oakland Art Why Is There a Housing Crisis?